Hit these trails around Maryland to get a great view of the state from your bike. From two wheels you can experience Maryland’s history, be it the broad canal running beside the Potomac River, or a fort built to protect a young nation’s capital city. Cut through one of Baltimore’s famous urban parks and right into its lively Inner Harbor. Visit a museum full of artifacts pulled from a dig. Go to the coast where horses roam the beaches. Make sure your helmet strap’s on tight. There’s a lot to see! The “Grand Old Ditch” was built to connect the country; today, it’s a biker’s paradise with hundreds of miles of trail. The path begins in Cumberland, and includes several other notable stops, but it’s easy to take a self-guided tour thanks to a mobile app that explains the historical significance of selected areas along the trail. Here’s another chance to experience history, as the bike paths will take you through the 200-year-old stone fort built to protect Washington, D.C. Plan your trip around one of the artillery demonstrations and other reenactments at the site. Set atop Wisp Mountain, this venue offers a bit of everything, from whitewater rafting to climbing to biking scenic trails around the 550-acre Fork Run Recreation area. This park features more than 50 miles of well-kept trails running along the scenic creek and around Clopper Lake. Stop off to see Black Rock Mill, partly restored with exhibits about the 1815 mill and how it worked, and the Seneca Schoolhouse, a one-room schoolhouse built at the end of the Civil War out of the same signature red Seneca Sandstone used to build the Smithsonian Institution’s Castle. 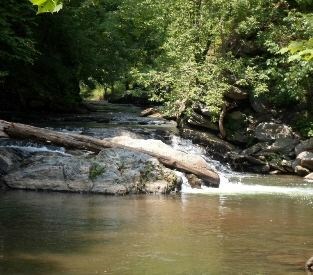 One of Maryland’s largest and most diverse recreation areas welcomes bikers for short or long trips. The Torrey C. Brown Rail Trail follows 21 miles of the old Northern Central Railway all the way to the Pennsylvania border. The refurbished train station in Monkton is a must-stop for visitors who want to learn the history of the trail, grab a quick bite or stop off at the nearby bike shop. Want to really immerse yourself in the city of Baltimore? Take this ride. This quickly-changing trail covers 15 miles and connects to more than 30 neighborhoods in west and southwest Baltimore. Riders pass notable landmarks such as M&T Bank Stadium and the Inner Harbor. A series of trails runs through and around this park that is home to the state’s archaeology museum. Stop by the Maryland Archaeological Conservation Laboratory, which serves as the clearinghouse for artifacts dug up by state and local agencies throughout Maryland. The 7.5-mile trail loops around the lake, home to freshwater fishing and some of the best bird-watching in the state. This place has it all: pristine beaches, wild horses, beautiful birds, and trails to challenge any cyclist. The island, a short ride from Ocean City, also has plenty of camping spots. Tucked in the northeast tip of Maryland, this area may be best known for its ties to horses and equestrian sports, but you can also find an approximately 80-mile trail system there that offers some of the best mountain biking in the state. Hop on your bike and see Maryland from a more intimate perspective. 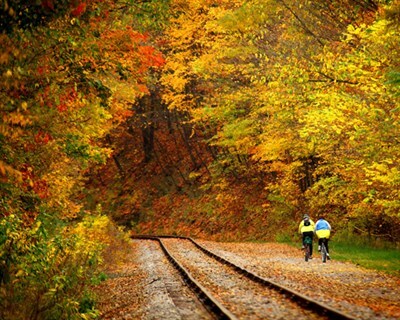 Bike or hike from Cumberland to Pittsburgh on one of the most beautiful trails in America.